» Archived Review: H. W. RODEN – Too Busy to Die. 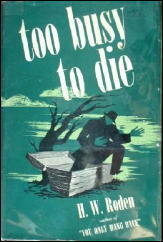 Archived Review: H. W. RODEN – Too Busy to Die. 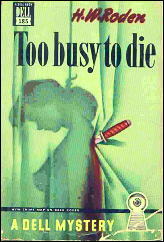 H. W. RODEN – Too Busy to Die. Detective Book Club, hardcover reprint, 3-in-1 edition (no date). First edition hardcover: William Morrow, 1944. Other hardcover reprints: Grosset & Dunlap (no date); World, 1946. Paperback: Dell #185  & #349 ; both mapback editions. Knowing little about the author, H(enry) W(isdom) Roden, 1895-1963, I first checked with Al Hubin’s Crime Fiction IV (naturally), and besides the information found in the first part of this sentence, I learned that Roden was an executive with various food corporations over his lifetime. Private detective Sid Ames was a character in all four of his mystery novels; sharing the bill on three of them was public relations expert, Johnny Knight. Here are the titles of the four books, all published first in hardcover by Morrow, in what I believe is correct chronological order: You Only Hang Once (1944), Too Busy to Die (1944), One Angel Less (1945 and the only solo appearance of Sid Ames), and Wake for a Lady (1946). On Kevin Burton Smith’s thrillingdetective.com website, he claims the city that Ames and Knight called home was New York City, but I’m not convinced. It’s not named in Too Busy to Die, but the surroundings to me don’t feel like Manhattan — much more like a small Midwestern town, but it had me wondering all the way through. Tellingly, Hubin does not identify the setting either. Sid Ames takes only a secondary role in the one I’ve just read. The story is told by Johnny Knight, who hires Ames after a client is found murdered in his hotel room. The old man, now rich with Oklahoma oil money, had come to Knight with a far-fetched story of trying to locate his former adoptive family, from whom he had run away when he was a kid. “Lammed,” is his very word. So, with a $2000 fee in hand, Knight feels obligated to find the man’s killer. This is one of those typically 1940s wacky type of screwloose capers, complete with a beautiful blonde, a pint-sized bombshell named Patricia Rodkins who is not only deeply involved in the case but who also goes completely gaga over Knight at first glance, reason unknown but Johnny does not mind. Diamonds are also involved, in a package the dead man had left in Johnny’s care, and two families (and hangers-on) of strangely-behaved matrons, dipsy husbands, assorted personal assistants, a hulking lug named Homer and a butler who is also the operator of a well-known west side crap game. I dropped Pat at her house and returned to my apartment. I found I had a visitor. Sid Ames sat in my living room. He looked very comfortable. He was stretched out full length on the couch. He had taken off his coat and shoes. A half-emptied highball glass rested on the floor within easy reach. He had just turned to the final pages of the latest Perry Mason story when I walked in. “That Della Street is some dish.” He addressed me as if Della were a personal friend of mine. “But what’s the matter with that guy Mason? There she is all the time waiting to be– Oh, well–” he finished, tossing the book on the floor. “Make yourself at home, fellah,” I grinned at him. With the body found on page 189, however, there are no more jokes. Things get serious and quite a bit darker in tone, and in spite of the relative loony atmosphere at the beginning, you begin to wonder if the mystery could possibly have a well-explained, coherent ending. It doesn’t. And the aforementioned eight pages of tangled reasoning and impossible coincidences ensue. Johnny is also one of those guys who reports on what he sees but nothing more, nothing on what he’s actually thinking. And when he doesn’t comment on the obvious, the reader (that’s me) begins to think that either (a) he’s a lunkhead, or (b) the reader (again that’s me) was wrong, or at least sadly mistaken. On the other hand, do I regret the two or three late evening sessions I spent reading this? No, not at all, and I must have the other three of Roden’s books around here somewhere.